Presidential faces in the sky | A balanced diet . . . Crossing the Great Plains east to west, and west of the Badlands, you become aware of a dark line on the horizon. Is that an approaching storm? It could well be. But as you get closer you realize it’s an isolated range of hills, rising about 4,000 feet above the surrounding plains. These are the Black Hills of South Dakota, which have their maximum elevation in Harney Peak (7,244 feet). Sacred to many of the Native American tribes of the Great Plains – principal among which were the Sioux – their sanctity was violated when the 1868 Treaty of Fort Laramie (which had ‘supposedly guaranteed ownership of the Black Hills to the Lakota and other tribes) was broken following by the discovery of gold (ironically by General George Armstrong Custer). The United States government was unable (or incapable) of preventing the invasion of the Black Hills by miners. Conflict between the settlers and the Native Americans was inevitable. For many – certainly on this side of the Atlantic – their first introduction to the Black Hills must have come from the 1953 movie Calamity Jane starring Doris Day in the title role and Howard Keel as Wild Bill Hickok. Certainly it was a highly sanitized (and fantasized) interpretation of events around that time. But who can forget this particular song? Released as a Doris Day solo, I certainly remember it very well from my childhood right through the 1950s. We were heading for Rapid City and the Black Hills with one particular destination in mind: Mount Rushmore National Memorial. Under normal circumstances, I wouldn’t normally visit an attraction like Mount Rushmore. Like many others I’d seen my first images of this iconic location in Alfred Hitchcock’s North by Northwest. I guess I thought the whole experience would be rather kitschy – and my fears were not allayed as we drove from Rapid City to Keystone in the heart of the Black Hills, and on to Mount Rushmore, just a mile or so beyond. Either side of the highway were various tourist attractions that I would never visit in a month of Sundays. Just not to my taste. But how wrong I was about Mount Rushmore. In fact it was almost an emotional experience. The day was superb; hardly a cloud in the sky, and we joined several thousand more tourists (many from Asia) to marvel at the wonder of the Mount Rushmore National Memorial and how the faces of four famous presidents Washington (#1), Jefferson (#3), Roosevelt (#26), and Lincoln (#16) came to be carved into the side of a mountain. And why these four presidents were chosen from all the possible candidates. Although I guess the contributions of some presidents to the development and well-being of the United States are best forgotten. 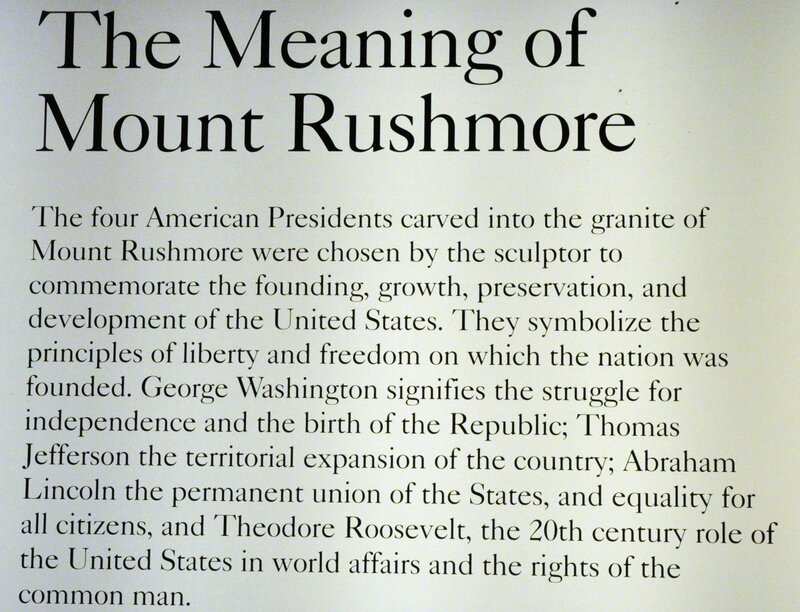 There is so much more written about Mount Rushmore in the link provided above – and more than I can eloquently draft; other details are provided by the National Park Service. I was overwhelmed by Mount Rushmore – no doubt the beautiful day helped. But I was also inspired, not only about the people who had the foresight to create this national memorial, but also that the choice of these four presidents encapsulates the history of their diverse nation. So let me tell some of my Mount Rushmore story through the images I captured that June day. Traveling south from Mount Rushmore, and passing through several tunnels just wide enough for a SUV but no bigger, there is an opportunity of experiencing the beauty of the Black Hills – and appreciate why Native Americans held this place to be so special. In Custer State Park there is a healthy herd of about 1,300 bison, some of which we came across. A hugely damaging fire in 1990 opened up much rangeland, but even so, there is a bison round-up each September to manage the herd, and sell several hundred animals and keep the herd at a level which the park can sustain. Taking a roundabout route back to Rapid City, we enjoyed the Needles Highway between Custer State Park and Hill City, and traveling north, we then took the back highway Sheridan Lake Road into Rapid City for our second night there. We didn’t visit the half-finished Crazy Horse Memorial, however. It was rather out of our way, but also it seemed to me to be a rather more exploitative and touristic attraction. There’s actually no known image/photo of Crazy Horse – one of the most important Indian leaders who played a pivotal role in the defeat of General Custer at the Battle of the Little Bighorn in June 1876, and who perhaps deserves a more fitting memorial in any case. 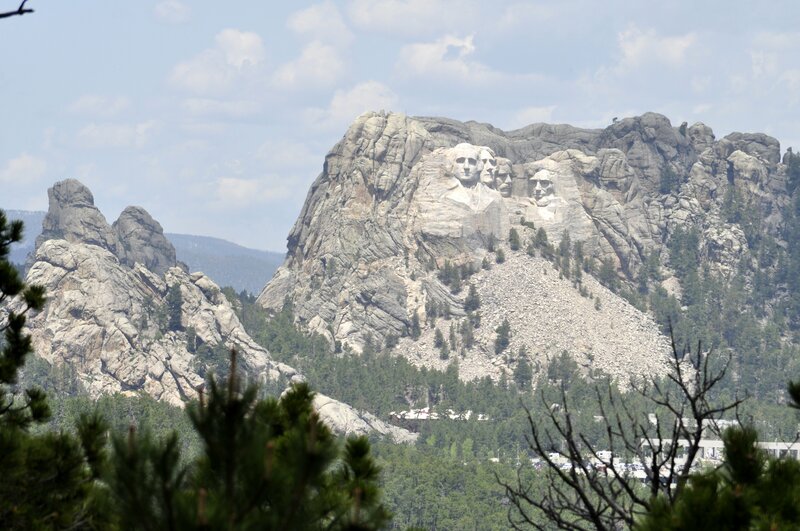 This entry was posted in Out and about, Travel and tagged Black Hills, Custer State Park, George Armstrong Custer, Mount Rushmore, South Dakota, travel, USA.